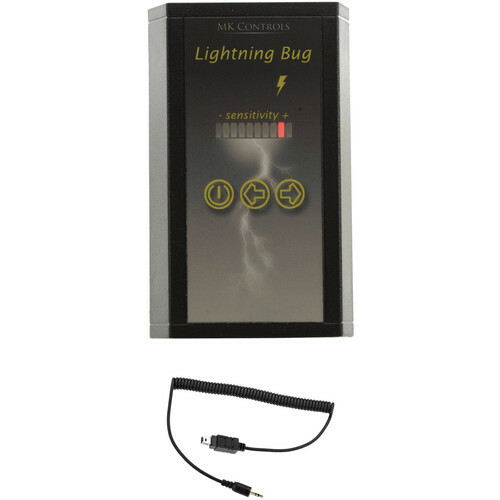 The Lightning Bug Shutter Trigger with Cable for Select Nikon DC-2 Cameras from MK Controls helps you to photograph lightning by sensing the unseen infrared light that precedes a lightning strike and then triggering your camera. It can attach to your camera's hot shoe, or to a cold shoe on a stand. The Lightning Bug has an LED indicator that displays your current sensitivity level from 1 to 26. The lower the sensitivity is set, the brighter and closer the lightning must be to trigger the Lightning Bug. You can also set the amount of times the Lightning Bug will trigger your camera from 1 to 10 frames per second. Three soft-touch buttons on the top of the unit control the power, FPS, and sensitivity levels, and they are water resistant so you can continue shooting in light rain. The Lightning Bug is made in the USA. The Lightning Bug Shutter Trigger from MK Controls helps you to photograph lightning by sensing the unseen infrared light that precedes a lightning strike and then triggering your camera. It can attach to your camera's hot shoe, or to a cold shoe on a stand. A shutter-release cable that is compatible with your camera and a 9V battery must be purchased separately for operation. This Vello 2.5mm Remote Shutter Release Cable is a coiled cable for connecting a Vello remote shutter release receiver or other remote receiver with a 2.5mm jack to select Nikon cameras. Box Dimensions (LxWxH) 8.7 x 4.0 x 2.5"
Box Dimensions (LxWxH) 5.0 x 3.0 x 1.0"
Lightning Bug Shutter Trigger with Cable for Select Nikon DC-2 Cameras is rated 4.6 out of 5 by 5. Rated 5 out of 5 by Weather Wanda from Fast as lightning! With only one use under my belt, the lightning bug has surpassed my expectations. The sensitivity controls allowed me to photograph lightning in a storm from miles away. I'm excited to see what the future holds with the Lightning bug trigger as my storm companion. Rated 5 out of 5 by Anonymous from The best thing to come along since digital cameras! I love the Lightning Bug!!!! It works great and is very well built. Highly recommended!! Rated 4 out of 5 by Jay from Finally one that works I had bought the Vello Freewave Stryker before. It only worked on superbright very close lightning. And then only at night. Just plain junk. Like all the others have said, You get what you pay for. It's amazing how much better the Lightning Bug works. If you're serious about lightning photography spend a little more and get this one. Rated 4 out of 5 by Robert from Works great I wanted a reliable product that would trigger fast enough, function day or night, and be sensitive enough for distant lightning and smaller strikes. I knocked off a star for the user interface, features and setting determined by decoding the pattern of led lights. Seriously, no one could intuitively know what these codes are. Don't lose the manual. Rated 5 out of 5 by Paul from Happy to have this tool in my kit. Use for obvious reason, lightning photos. Night lightning photos are easy but if you want to capture daylight one of these are a must. Easy to set up and as dependable as more expensive units. Practice safety is important when doing this type of photography. Will this work with the Nikon D5000? Yes; the Overview on our website states the DC-2 sync cable included with the MK Controls Lightning Bug Shutter Trigger is compatible for use with the Nikon D5000 DSLR camera. Does the company sell a cable that will also connect the Lightning Bug to a 10 pin camera like the D800 or will a separate unit have to purchased to be used on 10 pin cameras? Is this compatible with the old Nikon D-70? When you go to checkout it will ask the questions on which Nikon you have. Just click the box that has your Nikon. Hopefully yours is listed. Will the DC-2 cable work with the D7200? Yes. I have a D7200, and the DC-2 cable supplied (if that's the option you choose) works with it.